Everyone loves a new set of luggage and that excitement usually dies down after a while, however, you’ll keep falling in love over and over again with these suitcases we have picked out here. If not to play around with the luggage for the sole reason this list his based on *cough spinner wheels cough* then at least because who doesn’t love a stylish and functional suitcase. We’ve reviewed countless spinner suitcases to come up with the perfect luggage for those that love having extreme mobility while traversing airports and train stations. The spinner luggage below are some of the best that’ll you’ll find for various budgets. This is the “On the Prowl” spinner suitcase by Lily Bloom. While this piece is amazing, the luggage in general by Lily Bloom is absolutely fantastic and always has a great looking design. 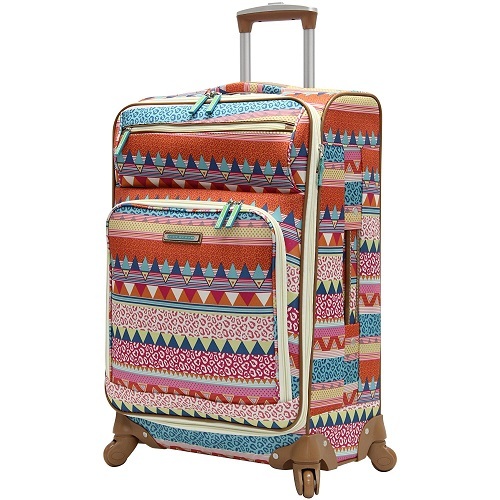 Lily Bloom offers similar spinner luggage in a couple other designs. These include the Desert Sierra, Forest, What a Hoot and Wildwoods, all equally impressive in their design. A neat feature about Lily Bloom that a lot of people may not realize is that each piece is made from a signature fabric that is actually created from recycled plastic bottles. Not only is it stylish but also environmentally friendly! Lily Blooms durability with its luggage has been tested time and time again and they can definitely hold their own. When we tested this suitcase out the fabric exterior held up extremely well considered it’s made of recycled plastic. The luggage also utilizes reinforced handle poles so that they are durable and provide extra strength for those numerous trips. It also does a great job at protecting your spinner wheels so that they do not break. 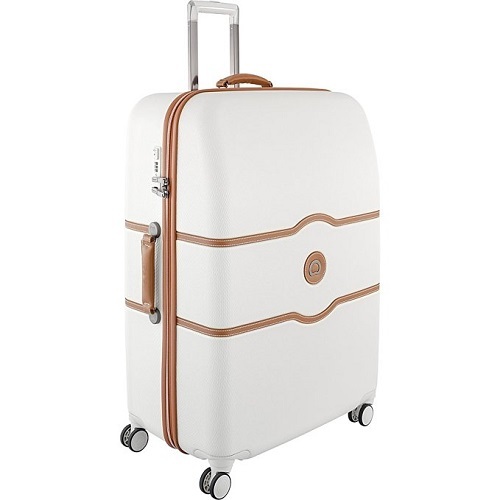 Lily Bloom suitcases are very well designed to stand the test of time. If that’s not enough for you they also offer a 5 year warranty! The functionality of the Lily Bloom luggage is top notch. While it doesn’t have all of the bells and whistles, what it does, it gets right. For example, we’re always trying to avoid airline fees right, so Lily Bloom makes sure to make their suitcase with a lightweight construction. Lily Bloom also obviously includes spinner wheels (which perform fantastically) as this post is titled “Best Spinner Luggage”, ergonomic handles for when you’re pushing or pulling your luggage along, expandable capability to increase your load from 100 liters to 112 liters and excellent organization with its 3 interior pockets and two exterior ones. This is the Baseline Large Expandable Spinner by Briggs & Riley. This one is pretty tame with its design and color selection but design plays a very small role in the over factoring of best spinner luggage. The Briggs & Riley Baseline is aptly name as the colors are very much a baseline. They include black, navy and olive. The suitcase itself is constructed of 95% nylon, 3% aluminum and 2% rubber and in case it matters to you, it is imported. When it comes to durability it doesn’t get much better than Briggs & Riley. To go back to the material used in the construction of this excellent spinner luggage, the Baseline is made with ballistic nylon which is perfect for resisting abrasions, dirt and moisture. The best warranty offered in the industry in my opinion comes from B&R. They offer the, SIMPLE AS THAT WARRANTY, which is a lifetime warranty. You don’t have to be the original owner, have a receipt or even explain what happened; you simply have to pay for the shipping to the repair shop. It really is a lifetime warranty that is unbeatable. They even cover airline damage. While the price tag is up there, it’s worth it in my opinion if you are even considering spending half of that on another product because the bag is basically guaranteed forever and you’ll never have any worries. The functionality of Briggs & Riley is nothing to look past either. 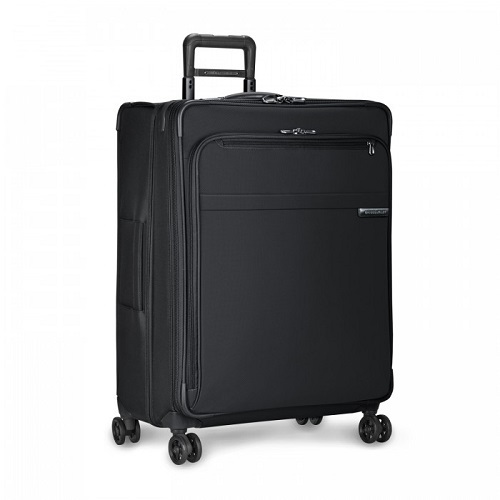 Obviously it comes with the spinner wheels for effortless navigation and some other basic features such as garment securing panels an exterior zippered pocket and exterior SpeedThru pocket for quick access to documents at security checkpoints. But it also offers a few neat features you don’t see in other luggage. It comes with a garment suiter that holds 1-2 suits and prevents wrinkling with its foam roll bar, an outsider handle for wrinkle-free flat packing which helps with interior capacity and if you needed more room it also has a CX expansion-compression system. This system increases capacity by 26% and is easily compressed with a push of a button! Although it’s a little of the heavy side and the price tag is a little high, it’s absolutely top notch quality that will last you, well, forever! This is the Jardin 24” Spinner by Nicole Miller. The Jardin is made for those that are seeking an eloquent style while still getting some decent functionality. The Nicole Miller spinner comes in two variations, black and mauve which is basically a fancy word for purple. The Jardin screams sophistication as it’s made with luxurious tweed prints and accented with gold colored zippers and handle. The durability of the Jardin expandable has done well during my first run through with the piece of luggage. We took it on a short 3 day roundtrip flight. I was surprised to find that it did not have any scuffs or scratches and it held up very well. The zippers are doing a great job as well as the retractable handle. Overall I’m thoroughly impressed. The only concern is that I was unable to find any warranty listed anywhere. Luckily the price tag isn’t bad at all. The Nicole Miller Jardin’s functionality is nothing to brag about but it does a fine job. It comes with those 360 degree spinner wheels that everyone loves, telescoping push button handles, lots of pockets to store additional items, is extremely well balanced and of course it is expandable. This is the Andiamo Elegante Spinner. Andiamo is an Italian company that specializes in luggage and Andiamo translates to “Let’s go”, very fitting! 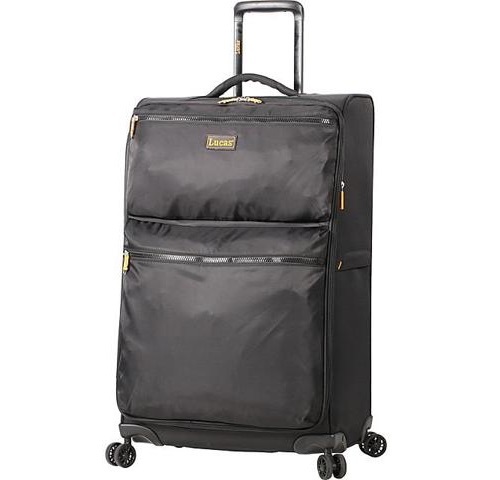 The Andiamo Elegante luggage comes in a couple of colors, black pearl, gold and quartz. My favorite is bar far the black pearl, who wouldn’t love saying that name. The design of the Elegante is unique in that it’s created with groove all along its exterior. It’s made outer shell is made of 100% polycarbonate and an alloy metalized finish. 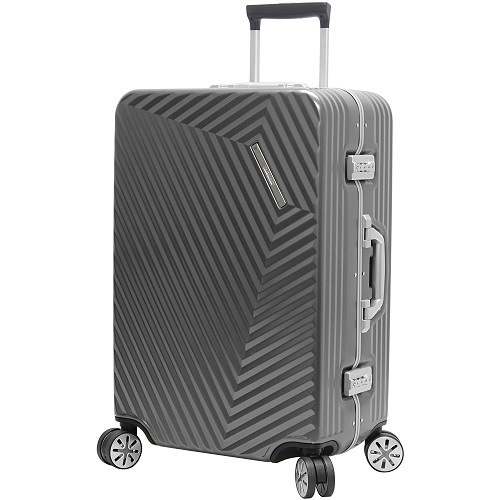 The durability of a spinner suitcase like this is pretty impressive with the tough hardside polycarbonate body. Its aluminum magnesium frame doesn’t hurt either, making it very lightweight and strong while providing that sleek profile everyone desires. The wheels are well made with double spinners for each corner which provide an effortless glide and the handle of the Elegante is quite durable as well. If for any reason you have any issues with your gear coming undone, which I highly doubt, then Andiamo also offers a 10 year warranty for your peace of mind! The Andiamo Elegante has some standard functionality that you would expect in travel gear especially for one in this price range. There is an integrated TSA approved lock to provide exceptional security for your luggage while traveling, 8 wheel spinner system which gives you superb mobility, a recessed dual locking and unlocking extendable handle which go along great with the top and side streamlined handles. The Chatelet by Delsey Paris is a beautiful piece of luggage made by one of the best luggage makers in the business. Delsey Paris produces great travel gear and the Chatelet is no exception. Delsey offers the Chatelet in a few color options but “Champagne” is definitely my favorite. But I promise you this Delsey Paris spinner, regardless of what style you go with, will get you many compliments. The durability of the Chatelet is excellent as it is constructed with 100% polycarbonate which makes it not only lightweight but very durable with its hard shell. 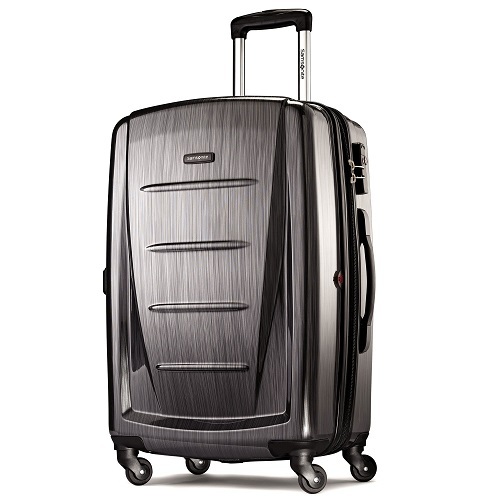 The wheels are excellently made and glide very well which is what you would expect with a piece of spinner luggage. Also if you’re a little too rough with your Delsey Chatelet then don’t worry as they offer a fantastic 10 year warranty! This Chatelet offers some unique features that I’ve never seen in a suitcase before. My favorite by far is the brake system. You can simply press a button and it will lock the two front wheels so you can even leave it on a ramp without worrying about it rolling away. There is also a recessed TSA approved lock that uses a 3 digit combo, compression straps for your clothes inside the suitcase and a zippered mesh divider on the other side of the suitcase. Finally two interior bags and a hanger are included to provide you with optimal organization. With one of the longer names on this list the Ricardo Beverly Hills Topanga Canyon is one of our more budget friendly options yet still has impeccable style! The Ricardo suitcase comes in two simple options white and black and they sure do look great. It is made of polypropylene which gives it a beautiful hard shell exterior while also keeping it lightweight and durable. Also, should it matter, this suitcase is imported. The Topanga Canyon Spinner is an excellent buy for the money because of a number of reasons. The durability on the Ricardo expandable luggage is amazing as it has been thrown down a flight of stairs (not on purpose) and survived without a scratch, the handle is sturdy and the wheels do a fantastic job on all different types of terrain. If that isn’t enough for you then you can rest easy knowing that the Ricardo Beverly Hills Spinner comes with a 10 year warranty! To get that at this price is unbelievable! 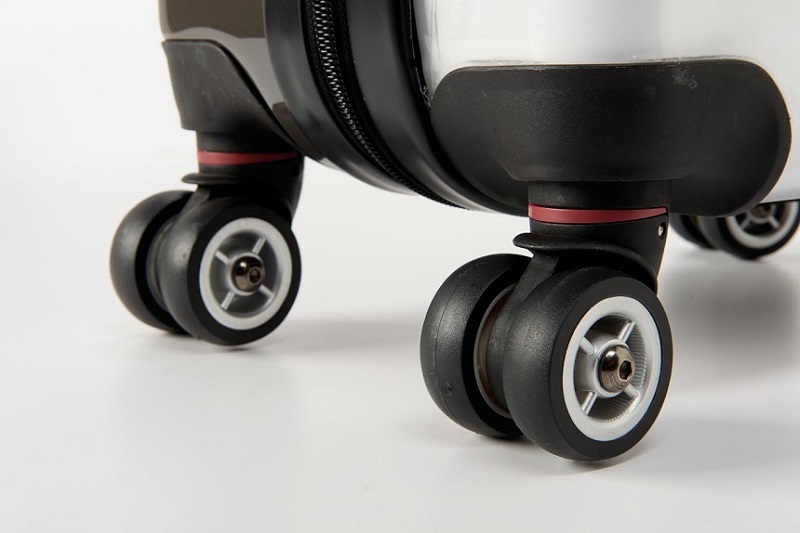 The features on the Ricardo include a number of mainstays that include: duel spinner wheels to provide exceptional smooth rolling in any direction and sleek and comfortable handles while you’re pushing or pulling your luggage along. It has a pull handle that can lock and adjusts to different heights to accommodate most everyone, interior organization with zippered and mesh compartments to keep your luggage neat and of course it is expandable. Finally a little neat addition is the elastic storage pouches for packing your shoes separately from your clothes! The American Tourister LiteSPN is probably the best purchase you could make if you are looking for cheap spinner luggage. The price tag on this is always low and the style of the rolling luggage is excellent. American Tourister offers this spinner bag in a grey and green combo that is unique from a lot of other boring luggage. 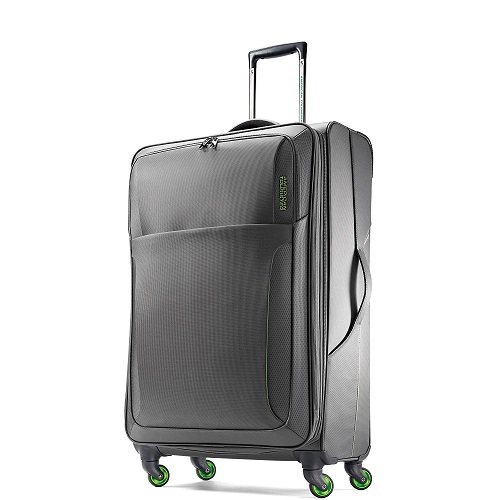 One of the best styling decisions with this piece of luggage are the wheels as they are colored green and look amazing. The LiteSPN luggage is made of a durable polyester fabric that provides exceptional protection while also keeping it very very lightweight at only 7 lbs. Of course the whole reason of buying spinner luggage is to do awesome 360 degree rotations with your luggage right? Well you’ll be glad to know that the wheels feel very sturdy and well-made and I don’t foresee any problems with them. Obviously if you’ve checked the price by now you understand that for this inexpensive luggage you aren’t going to get all of the greatest bells and whistles but it’s an excellent suitcase for someone who doesn’t need all that and is on a budget. The American Tourister LiteSPN comes with the obvious 4 spinner wheels, and compression straps on the inside to keep luggage organized. It has a push button locking handle and handles both on the top and side that are integrated into the suitcase. It is also expandable to provide you with extra storing capacity! Plus it doesn’t hurt that it comes with free shipping from Samsonite! Lucas luggage isn’t an extremely well-known brand but they offer a quality bag at a reasonable price. Their designs are a little different as well which will make your suitcase stand out when rolling around the carousel at the airport. The Lucas Ultra Lightweight Spinner comes in 3 different color options for you, black, lavender and royal blue. What’s different about these suitcases is the actually the exterior. The front face of the suitcase is basically wrapped in a flexible fabric which gives a distinctive look! The durability with this luggage is impeccable. The fact that it is ultra lightweight luggage doesn’t hurt. It also helps with airline fees! The handles are made of aircraft grade aluminum which also makes them extremely lightweight and able to absorb a lot of shock, it has great strength and durability. The wheels, the most important part, are excellently made with lightweight yes sturdy 100% PU material which helps withstand long term wear. If that’s not enough, they also include a 5 year manufacturer’s warranty! 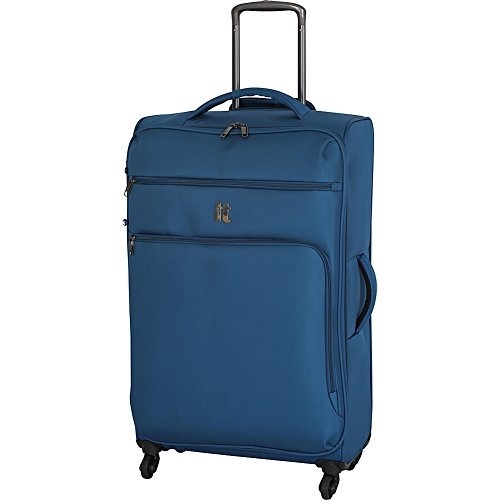 The Lucas comes with the fantastic 360 degree spinner wheels and work very well over a variety of surfaces, the handles are built ergonomically so that they will be comfortable to use and not hurt your hand and it’s also expandable for extra capacity to pack more of your clothing or souvenirs! The fully lined interior has excellent organization with multiple pocks and you also have two more additional zippered pockets on the outside. And did we mention it’s extremely lightweight! 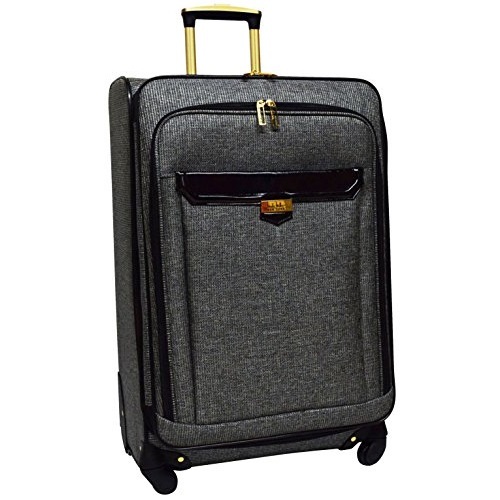 Another piece of affordable spinner luggage on our list the IT Luggage MegaLite is an exceptional full size spinner suitcase for a very reasonable price. The MegaLite spinner comes in a number of color options as well which is always nice to mix it up and have variety. You have your choice between, blue ashes, black, baton rouge, blue grotto, fiery red and flint gray. IT Luggage carefully took into consideration the materials they would use to ensure durability, strength and lightness. It shows as their bag is made of high density polyester that makes the bag weigh only 5 pounds! The wheels also hold up very well even when travelling internationally and the handles and extendable handle are all reinforced to last you for many trips to come. Not to mention they are tested for comfort! For an exceptional spinner at this price you can imagine that the features will be pretty basic and they are. There’s nothing wrong with it, you just get what you pay for. The MegaLite luggage comes with the 4 wheels that makes the suitcase glide effortlessly and are extremely quiet. When you’re not busy having fun rolling your luggage all over the airport or train station then you can easily tuck your extendable handle away with a single push of a button. There are two exterior zippered pockets to provide you with some simple organization and the interior features compression traps and a zippered mesh pocket on the lid side. Finally the bag is expandable in the front to provide a little extra storing capacity in case you pick up some items you want to bring home but would otherwise have no room for. We round off this best spinner luggage list with a staple from one of the most well-known luggage companies around, Samsonite. This is the Samsonite Winfield2 and is quite a looker. I have to say I love the design of the exterior and particularly the charcoal color but you can also choose from orange, purple, deep blue, black, burgundy, dark blue, dark grey, deep orange and deep purple. As I’m sure you can tell this is a hard shell spinner that is made of 100% polycarbonate which makes it not only durable but also lightweight. It’s made to absorb impacts by flexing with the pressure applied to it, then popping right back to its original shape. The wheels are excellently made as well which provides you with a sense of comfort that they won’t fall off during your journey. The handles also are well made especially the extendable handle as it was very comfortable to use while moving through the airport. Now while this all sounds great, accidents do happen and honestly hard shell suitcases scare me even when they are designed flawlessly. That’s why you can rest easier knowing Samsonite offers a warranty on its luggage. The features that come with a Samsonite suitcase are typically better than your average joe suitcase and this Winfield2 is no exception. The Winfield2 suitcase, to start, comes with a TSA approved lock that is mounted on the side of the bag right above the handle. It is also expandable to provide you with extra storing capacity. And with that extra capacity you will want to make sure you organize efficiently and you’re able to do that with the compression straps and double mesh pockets that both are zippered on the lid interior. Finally it comes with oversized zippers which help you get a good grip and also 4 spinner wheels that are perfect for multi-directional mobility. There are a couple of factors that always goes into deciding what makes a list. These are style, durability and functionality. 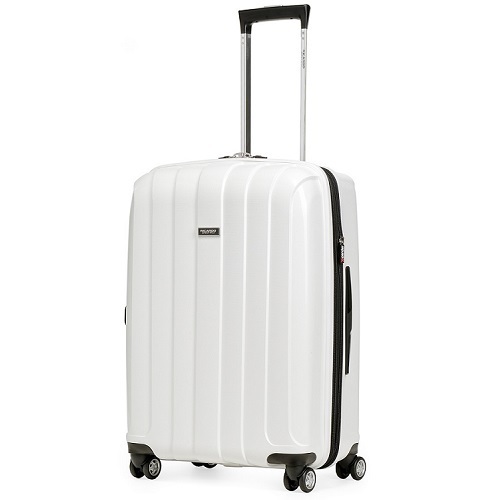 These are a staple, however, when a list is built specifically for spinner luggage you have to also look more closely at the actual spinner wheels and we also want to see a warranty in case you run into any issues with your luggage. If you’re worried about checking your luggage, check out our picks for great carry-on suitcases! The style of a suitcase is always important even if others say it’s not because nobody wants to lug around an ugly piece of luggage. We want something that looks great and stands out or at the very least looks sophisticated or clean with solid colors. It’s also important to take a look into the material the suitcases are made out of. Quite possibly the most important aspect of any product review has to be the durability of the item, how long it will last. Because what’s the point in even considering a product if it constantly breaks or has a history of issues. For this list we looked over the construction of the suitcase, how sturdy the handles are, the durability of the spinner wheels and of course if there is a warranty present. Functionality is what sells, you don’t look at two suitcases and say “I want the bag that I have to carry everywhere over the spinner suitcase” so we made sure to look at all the features of each piece of luggage. While this is a best of list, we would like to see uniqueness in each piece of gear and we do in some, but a lot of these suitcases come with features that have come to be known as standard so any uniqueness plays a big part in our decision. Of course price will have a role to play in this as well.